← The Book Talk on Youtube! 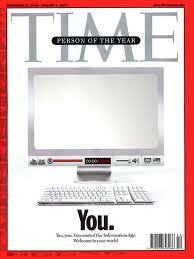 This is almost a complete 180 to the 2006 person of the year, “YOU.” The cover story article for that year went on to explain that the emergence of Web 2.0 gave the average global person unprecedented power to express himself/herself. Yet as I stared at the cover I couldn’t help but feel some misgivings: it felt as if the editors were being too clever, pandering to our self-congratulatory, egotistic, overly introspective nature. The “YOU” here was inward looking; the Protester, conversely, focuses outwardly. 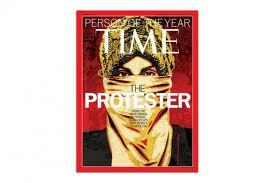 Kurt Andersen’s piece elaborating on Time’s choice of the Protester connects the dots so cogently among the seemingly disparate global protest movements. From the protests of the Arab Spring to the civil unrest across the EU to the diverging populous movements of the Tea Party and Occupy Wall Street (OWS), Andersen finds here a rebuttal to Francis Fukuyama’s 1989 claim that we had reached the “end of history.” According to Fukuyama, as a species, we had reached the end of our ideological evolution in Western Liberalism. With the rise in the global standard living in the 1990s and 2000s, according Andersen, protests became “quaint” and “obsolete.” (I’m not sure that I agree with that characterization of the WTO protests in Seattle.) 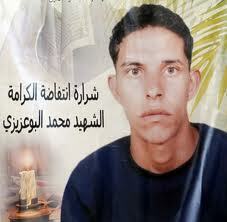 However, with the self-conflagration of Mohamed Bouazizi, the young Tunisian who set himself ablaze in protest against his government’s oppression, a spark ignited the powder cage that had been building. As Andersen characterizes the underlying global dissatisfaction, “For a critical mass of people from Cairo to Madrid to Oakland, prospects for personal success – for the good life at the End of History that they’d been promised – suddenly looked very grim.” With the toppling of long-standing dictatorships, see Mubarak and Ghadifi, the possible end to other corrupt leaders, see Putin and al-Assad, the ascendency of the Tea Party and OWS, I would say that we still have a long way to go in our political evolution. In depicting the mobs of ancient Rome, Shakespeare in a way draws on the two Latin words for a crowd of common people. The first is turba, the word from which we derive the English “turbulent.” A defining characteristic of a Shakespearean mob is its capacity to be easily swayed and quick to commit violence. The second is vulgus, which gives us “vulgar.” Vulgus most precisely translates to the common, general public; Shakespeare’s “mobs” are only ever composed of the working, artisan classes. Coriolanus: When one is thinking about the haves and have-nots in Shakespeare’s plays, Coriolanus stands out. Shakespeare presents a Rome very much divided along economic class lines. The play opens with the plebeians rioting due to high corn prices that have been set by the governing patrician class. As becomes evident, the people are starving. In an episode that Shakespeare borrows from his source, Plutarch’s Lives, Menenius Agrippa, spokesperson for the senate, tells a fable in which the different organs of the body riot against the stomach for hording all of the food. The gist of the Menesius’s fable is that stomach, i.e. the patrician senate, must digest the food for the rest of the body, i.e. the plebeians. 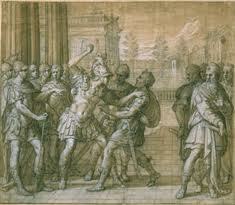 In comes Coriolanus, who has this to say about the plebeians’ demands for fair corn prices: “Hang ’em! . . . They say there’s grain enough!/ Would the nobility lay aside their ruth [i.e. compassion]/ And let me use me sword, I’d make a quarry/ With thousands of these quartered slaves, as high/ As I could pick my lance.” (I.i.191,197-201) Damn! If you did not catch that, essentaily what Coriolanus said was that his way of resolving the situation would be to carve these starving people into quarters and pile the remains as high as he can lift his lance. I have to wonder if Coriolanus would sign up for some overtime to pepper spray and taser the OWS protesters. Granted that Coriolanus’s hamartia, or tragic flaw, is his elitism, yet the play’s ultimate villains are the tribunes, Velutus and Brutus, who were elected by the plebeians to protect their rights. Btw, it is in this play that we get a common way that Shakespeare describes the mob, “the many-headed multitude” (II.ii.16), essentially equating the crowd with the mythical beast, the Hydra. Julius Caesar: When discussing Shakespeare’s disgust with social protests, one of my favorite scenes to talk about is from Julius Caesar. The play begins with Caesar’s triumphant return to Rome having defeated Pompey. Shakespeare chooses to open with two patricians Marullus and Flavius, berating a crowd of plebeians for their openly rejoicing in Caesar’s victory. The two’s main complaint to the vulgus is its fickleness. As Marullus chides, “O you hard hearts, you cruel men of Rome,/ Knew you not Pompey? Many a time and oft/ Have you climbed up to walls and battlements,/ To tow’r and windows, yea, to chimney tops,/ Your infants in your arms, and there have sat/ The livelong day, with patient expectation,/ To see great Pompey pass the streets of Rome” (1.1.39-45). Who the victor is matters not at all to the vulgus; it simply looks to have someone on who to focus. This aspect of the Shakespeare crowd is nowhere more evident than in the Julius Caesar Act 3, sc. 3. Prior to this scene, Mark Antony delivers his brilliant “Friends, Romans, countrymen” monologue, essentially turning the mob against those who conspired against Caesar. 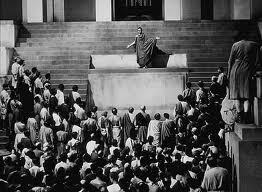 "Friends, Romans, countrymen, if you are in favor of taking down Brutus and Cassius wiggle your fingers in the air. And could we please stop with the drum ciricle for at least like five minutes?" Cinna: I am Cinna the poet! I am Cinna the poet! Fourth Plebian: Tear him to pieces for his bad verse! Tear him to pieces for his bad verses! Fourth Plebian: It is no matter, his name’s Cinna; pluck but his name out of his heart, and turn him going. Briggs, Julia. This Stage-Play World. New York: Oxford University Press, 1989. Martindale, Charles and Michelle Martindale. Shakespare and the Uses of Anitquity. New York: Routledge, 1994. Tupper, Frederick, Jr. “The Shakespearean Mob.” PMLA 12.1 (1912), 486-523. P.S. I will be reviewing soon the new film adaptation of Coriolanus, starring Raph Fiennes, Vanessa Redgrave, and Gerard Butler. Here’s the preview for the film. Enjoy!